It is crucial for businesses to have a local content strategy to boost and maintain search rankings. Local content increases the number of relevant keywords that your business has the opportunity to rank for. It is important to note that content does not just mean the written word, i.e. a blog. Content comes in many forms like video, email, ads, listings, images, infographics, and more. Mike Ramsey and Dana DiTomasao gave some great insights during their session at SearchFest 2015 in Portland. Mike Ramsey looked at the overarching content strategy from identifying your local audience, launching and promoting your content to measuring, reporting and refining the process. Dana on the other hand discussed a more in-depth, tactical guide to content creation. Below are a few of the most valuable takeaways from Mike and Dana’s SearchFest session on Local Content Strategy. It is not enough for your content to simply be unique, it must also be useful. Focusing on creating unique content can occasionally come at the expense of that content being useful. If readers don’t find use in your content, they aren’t going to share the content and they aren’t going to revisit it. If your content serves a purpose and provides a use, then readers are going to be much more likely to share that content with their network that may also find it useful. A few examples of useful content would be a list of the best spots in town, details about an upcoming event, or a “behind the scenes” video. For many, the belief is “if you create the content, they will come,” but that simply isn’t the case. Yes, your keyword rich content will bring in organic traffic, but to really get your content in front of people, you need to promote it. Utilizing Facebook Ads to promote your local content can prove to be an effective way to increase the visibility of your content. Paid promotion can make your content go a long way organically; a reader comes across your content via your paid promotion, and finds use in it, they then begin to share it organically and their network begins sharing it and before you know it your content takes off. 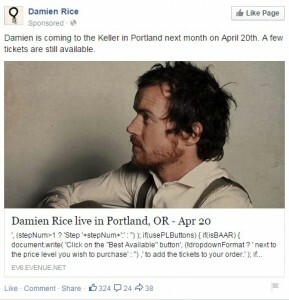 For example, someone sees the ad to the right on their Facebook feed and goes to the event page. That person then chooses to share the event using the share button on the event page or by sharing the URL. All subsequent traffic from this person’s share is organic, aka, free! Your brand voice is the how you establish your brand’s personality. This includes the kinds of words you will use in your content or when talking to your clients, how the company interacts with the customers, how you build familiarity and how you differentiate yourself from competitors. A brand voice provides consistency in your content regardless of the different individuals who may be contributing the content or interacting with your customers. It is also what makes your content interesting and different from everything else out there. It puts your mark on it and it makes your content meaningful for your brand and customers. For help creating your brand voice, Dana recommends utilizing Stephanie Schwab’s four-part formula for defining a brand voice. One of the biggest takeaways from both Dana and Mike was the importance of having a consistent, well-defined strategy. The above tactics will help you to create content that performs well and appeals to your readers, but it is also important that you have a plan for your content and that is where a content calendar comes in. A content calendar helps you organize the type of content you will be creating, who you are creating the content for, the keywords the content will include, when you will publish and how you will promote the content. For additional information on setting up a content calendar, read 5 Simple Editorial Calendar Tools. As more companies turn to content creation to stay relevant and maintain local search rankings, it is important for businesses to follow a consistent, well planned strategy for conceptualizing, creating and promoting their content. Utilizing the above concepts in your own local content strategy will help your company to compete in the ever changing world of Local SEO.